The Museum is in one of the buildings in the Aviation Heritage Centre, East Kirkby, near Spilsby, Lincolnshire, PE23 4DE: tel 01790 763207. East Kirkby is on the A155 SW of Spilsby. For admission details please visit the Aviation Heritage Centre website. The Centre does not open on Sundays. The RAF Escaping Society Museum was first established in the mid 1960s at a Whitbread public house in Mabledon Place, off Euston Road in London. The pub - renamed The Escape - was in more of a student than a tourist area and attracted insufficient interest. The items shown were withdrawn and given to the TV presenter Keith Fordyce for display in his Museum in Devon. His venture closed in the late 1970s and the items were stored on behalf of the Society until 1989. Discussions between Sydney Holroyd, a former Chairman of RAFES, and the Panton brothers of the Aviation Heritage Centre at East Kirkby eventually resulted in their agreement to display the items on behalf of RAFES. A special unit was built for this purpose. The late Ron Emeny AFM (207 Sqn, shot down on the Mailly raid of 3/4 May 1944 and the last airman taken across the Pyrenees by the Comète Line) was instrumental in refurbishing and adding to the items on display. The wedding dress made from his parachute is on display in the Memorial Museum in Caen. The photo of him is believed to have been taken during his evasion. The RAFES Museum was officially opened on June 4th 1994 by Captain Frank Dell, Chairman of RAFES. He presented an inscribed stone from Maison Alphonse, the house above the beach at Plouha in Brittany from where evaders on the SHELBURN line were picked up by Royal Navy MGBs. Eventually it became necessary to extend the RAFES Museum. 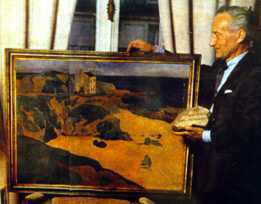 Helper J-J Piot from Paris, with a Maison Alphonse stone and a painting of the beach. 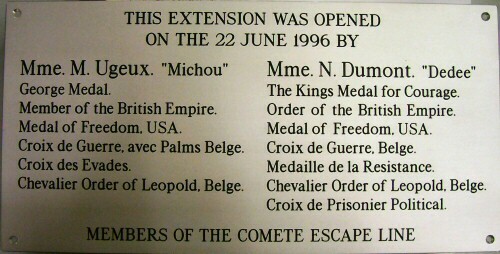 On June 22nd 1996 the Museum's extension was opened by two highly decorated COMÈTE Escape Line members, Mme Michelline Ugeux GM (Michou) and Mme Nadine Antoine-Dumont OBE (Dédée). The Museum has a very large scale model of the 'Colditz Glider' that was constructed in a cleverly concealed part of the attic in Colditz Castle. This was the POW camp which the Germans regarded as escape-proof, where those POWs they regarded as the most determined to cause them trouble were sent. Enthusiasts connected with the Colditz Society have built further models, to show that the Colditz Glider could have flown. In fact a replica has been made and flown, as shown in the final program in the Channel 4 series on Colditz early in 2000. There is a very interesting article about this glider on the Colditz website, written before the Channel 4 series - please click on the picture to visit that website. In Ravensbruck concentration camp a prisoner who had been condemned because she had been a Helper, had to take a coat from the dead in order to clothe herself. She donated it to the Museum. She said the coats had a 'white cross on the back to aim at us, red triangle for political .... I am glad to be rid of the coat, it has witnessed all the horrors ...' . This is that coat. This flag flew over the Gestapo interrogation centre in Avenue Foche, Paris. 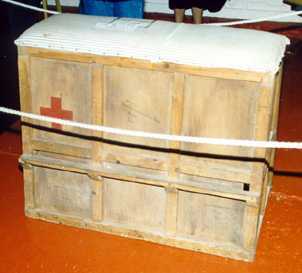 It was presented to RAFES by the children of helpers in 1947 and used to be on display in the museum. 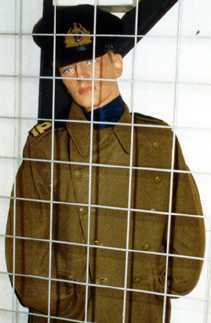 This is a replica of Albert RN, the dummy carried at roll calls (Appells) by 2 prisoners to make it look as if there were 3. This ruse concealed the absence of an escaper - the longer before the alarm was raised, the greater the chance of success for the man on the run. Escaping has been glamourised in film, but nearly all who got back evaded capture. This is a replica of the 'Wooden Horse' - the device which made possible a daring escape made famous by the book and film of the same name. 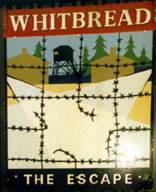 Eric Williams, Michael Codner and Oliver Philpot (later a Chairman of the Society and author of Stolen Journey) made a successful 'Home Run' after tunnelling their way out of Stalag Luft III. A team of prisoners carried out lengthy physical exercises using the exercise horse, watched by the German guards. The tunnel was dug by pairs of diggers the team transported inside the horse to and from the tunnel entrance every suitable digging day. The horse also concealed the diggers while they entered the carefully camouflaged tunnel entrance and continued work. Progress was limited by the amount of soil that could be carried back with them inside the horse.